St. Augustine was born in 354, to St. Monica – who’s Feast day we celebrated yesterday, August 27th. He was one of three children that was noted to live a loose and lazy life early on. It was through the prayers, fasting and alms giving of his mother, St. Monica, that he was eventually converted to Christianity, and baptized. In the summer of 386, in reading the life of St. Anthony of the Desert, he was greatly inspired. He went through a profound crisis leading him to convert to the Catholic Faith, abandoned his career of teaching in Milan, gave up his idea of marriage, and devoted himself entirely to serving God and to the practices of priesthood, including celibacy. According to Augustine, his conversion was prompted by a “Childlike voice” he heard telling him in a singsong voice, “take up and read”. Augustine sold his patrimony and gave the money to the poor. The only think he kept was the family house, which he converted into a monastic foundation for himself and a group of friends. In 391, he was ordained a Priest in Hippo Regius, now Algeria. He became a famous preacher, and was noted for combating the Manichaean religion, something he previously had believed in. There are more than 350 of his sermons preserved to date, and are believed to be authentic. In 395, he was made Bishop of Hippo. He remained in this position until his death in 430. He worked endlessly to convert the people of Hippo to Christianity. He left his monastery, but continued to lead a monastic life in the Episcopal Residence. Because of his leaving his monastery and becoming Bishop, he has been designated as the patron saint of “regular clergy”. After his conversion to Christianity he developed his own approach to philosophy and theology, accommodating a variety of methods and different perspectives. He believed that the grace of Christ was indispensable to human freedom, and he framed the concepts of “original sin” and “just war”. As the Western Roman Empire was starting to disintegrate, he developed the concept of the Catholic Church as being a spiritual “City of God”. He is a Doctor of the Church, and the patron of the Augustinian Religious Order. A Germanic Tribe invaded Roman Africa; they besieged Hippo in the spring of 430, when Augustine entered his final illness. One of the few miracles attributed to Augustine took place during the siege. While Augustine was confined to his sick bed, a man petitioned him that he might lay his hands upon a relative who was ill. Augustine replied that if he had any power to cure the sick, he would surely have applied it on himself first. The visitor said he was told in a dream to go to Augustine so that his relative would be made whole. When Augustine heard this, he immediately laid his hands upon the sick man, who left healed. Soon afterwards, he spent his final days in prayer and repentance, requesting that the penitential Psalms of David be hung on his walls so that he could read them. He directed that the library of the Church and all it’s books be carefully preserved. Shortly after his death, still during the siege, the city was burned to the ground. They destroyed all of it but Augustine’s Cathedral and Library, which were left untouched. Sometimes the life “we” choose for ourselves, is not always the life that God chooses for us. 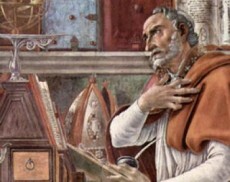 The life of St. Augustine is a great example of that. He spent his youth in a carefree style, and paid little attention to God or Christianity. It was through his studies, and the constant prayers of his mother, St. Monica, that he had a profound conversion. He went on to be baptized, ordained a Priest, and elected Bishop fo Hippo. He spent his life serving God, building up the Church, and converting the people in his care. What more can one do, but to search for God in many areas, finding Him, and then dedicating one’s life to serve Him? St. Augustine’s life and example lays that out, and how to overcome the struggles that we still face today. One would be wise to study his life, follow his example, and then call upon him when we need assistance.